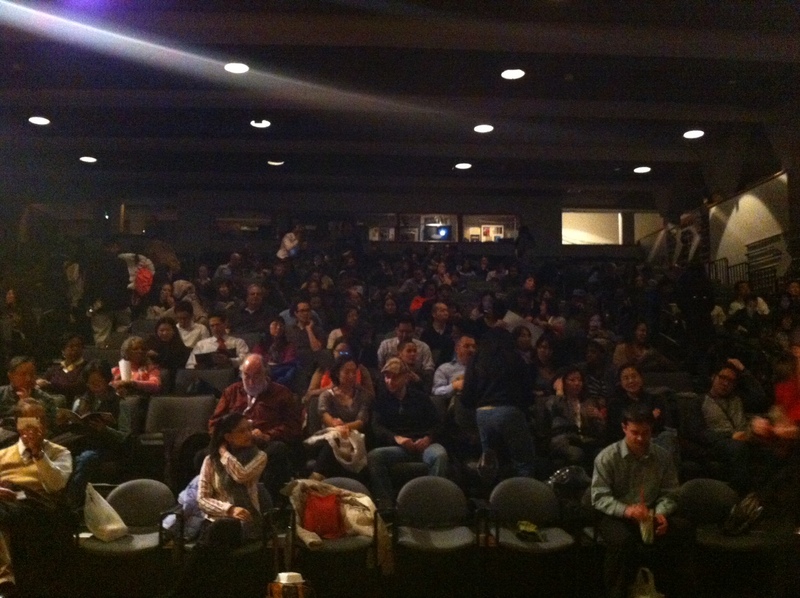 The 5th Annual Philadelphia Asian American Film Fest has been such a treat so far. Joe Kim and his crew are doing everything right. The mood is light, and the attitude of the festival is one of generosity and honest enthusiasm. They are just happy to be thriving, sharing good art, and fostering a way for Asian American perspectives to seep into the consciousness of Philadelphia. The free catered receptions, such as the one after Shanghai Calling that featured sushi from Mikado and pastries from Le Pain Quotidian (where I probably ate about $30 worth of food in three minutes), are a marked difference to the other larger festivals I have attended, and are closer to the model of the young up-and-coming programmers that preserve a social atmosphere. The size of the fest is ideal as well, with fifteen films spread out over ten days (and a break in between), one doesn’t feel the immense pressure or conflict to chose one film over another or see 5 in one day, nor does one have to travel between multiple venues that may be on opposite ends of the city. Sometimes you just want to see one film a night, and this festival lets you do that without making you miss something because of it. That tension is gone, and so it is easier to enjoy oneself. The International House makes so much sense as the venue, not just because of its size but because of what the I-House stands for. So far, almost every film has had some component of filmmaker/audience interaction, whether it be in-person, via Skype, or even both, which is a resource that the audiences have been truly relishing. I can’t wait for the second half of the fest although I wager I have already seen my favorite film! 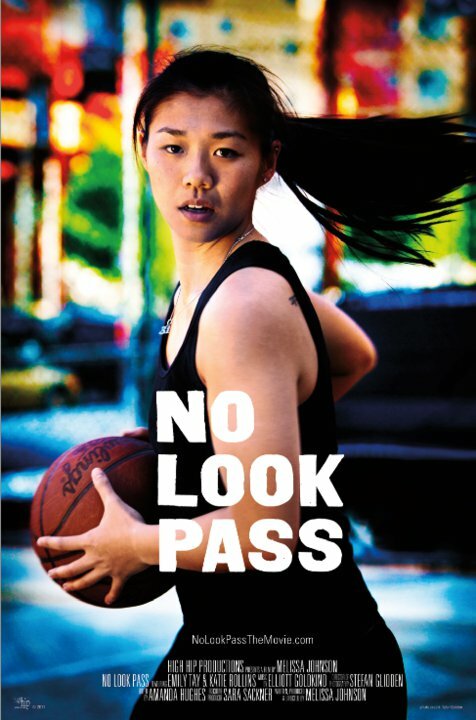 NO LOOK PASS was the Launch Night selection, screened at the fest’s original home, the Asian Arts Initiative (which is an impressive below-the-radar contemporary art space in Center City). This charming and simple documentary follows first generation Filipino American Emily ‘Etay’ Tay, a Harvard student whose passion and singular drive is basketball. Her talent is obvious, her ambition pure. More than a chronicle of her journey from college to the international professional circuit, No Look Pass is a reveal of Etay’s complex identity, and conflicting loyalties to herself, to family, and to friends. She and her friend Kate are a hilarious pair, and while Etay is quite shy, Kate’s gregariousness and filterless words create a balance. Etay struggles with being closeted, just as she feels a tension in her unconventional choice of career as it concerns family, but her parents are ultimately supportive of her, especially her father. Over the course of about a year and a half, we watch Etay evolve in so many ways, and yet the director never lets us think that we have the complete picture or that a person can be summed up in one film. We are treated to a formative chapter of one young woman’s life, done so in a straightforward manner more on the scale of verite than deliberate framing and restructuring by the filmmakers. 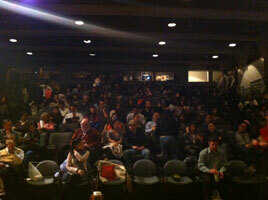 SHANGHAI CALLING, the fest’s Opening Night Selection, played to a lively and sizable crowd, that received the film warmly. Writer/Director Daniel Hsia presents a fresh and timely spin on the fish-out-of-water narrative. Spin is the most appropriate word because Hsia inverts a number of expectations of the genre wherein Shanghai Calling resides. This is a standout film, sharply realized, cleanly executed, with genuine humor and heart. Daniel Henney (X-Men Origins: Wolverine) plays Sam, a rising NY lawyer on the verge of making partner. Henney is everything that he needs to be as Sam, and more; suave, ambitious, and snide, alongside a keen sense of comedic timing, and subtlety of gesture. He is also rather easy on the eyes. When the firm’s head office relocates to Shanghai (where the film is shot on location), Sam’s seniors elect him to travel there on assignment. Being that he is Chinese American, they assume this is the “obvious” fit for him. However, it might be more appropriate to call Sam American Chinese, as he is radically distanced from his own cultural heritage. This is where many of Hsia’s fascinating inversions arise. When Sam gets to Shanghai, he constantly encounters white American expats who know vastly more about China than him, and speak the language. Sam’s difficult and entitled nature is tested, as is his ego and resolve when his advice to a client lands the firm in a complicated predicament that could mean the end of his career. Ultimately, Hsia takes us on a ragtag go-for-broke mission, that assembles the strange family of characters that have rallied around an evolving Sam, including his relocation specialist Amanda (Eliza Coup), and Donald (Bill Paxton) the mayor of America Town. The film was introduced by actor Sean Gallagher, who plays Brad, a character that leans in the Cosmo Kramer direction and is thoroughly enjoyable on and off the screen. After the screening, Gallagher helped moderate the Skype Q&A with Hsia (in Shanghai) and producer Janet Yang (in LA). I was laughing out loud throughout Shanghai Calling, and it was laughter that came from an honest place. Amid the laughs, Hsia raises some interesting questions about cultural identity in general, and specifically what it means to be Asian American / American Asian, where culture is inferred as something found rather than innate. He points to the new flow of immigration that involves waving goodbye to the Statue of Liberty, not hello, all the while telling a universal and entertaining story. 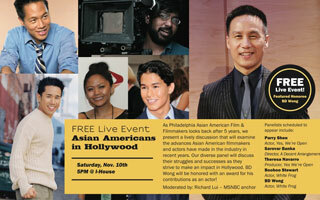 ASIAN AMERICANS IN HOLLYWOOD – PANEL DISCUSSION – One of the great surprises of the fest was the Asian Americans In Hollywood panel discussion held at the International House. Moderated by NBC news anchor Richard Lui, and featuring actor Booboo Stewart (White Frog), actress/producer Theresa Navarro (Fruit Fly), actor B. D. Wong (Law and Order SVU), Director Sarovar Banka (A Decent Arrangement), and actor Parry Shen (Better Luck Tomorrow), this collection of voices chimed in on an interesting line of questioning. Lui began by asking about what has changed in the five years since PAAFF began? At the outset, there was a unanimous indication of the emergence of new media (web) that spawned Generation DIY, and online funding sources like Kickstarter. These were described as game-changers in that they present an unparalleled platform from which to establish artistic/cultural/entertainment value from the ground up. The Asian American population seems to have embraced that potentiality the most as is explored in the documentary Uploaded. Theresa Navarro credited the Asian American audience for finally “showing up” for their creators and entertainers, such as the Lintensity phenomenon surrounding basketball player Jeremy Lin. She says that this newly invigorated supportive instinct is helping to foster the value and presence while creating a sense of normality in venerating an Asian individual in an American context. Lui asked, what will be the next milestone in the integration of Asian Americans into the regular mix. Parry pointed to the online instant-watching platform as the untested waters being honed by the young where rules of exclusion and demand are radically different. He says that when blended with the experience and hard work of seasoned actors and creators, this generational mix will produce quality content that is easy to proliferate. Sarover described a “niche-ification” enabled by those same new media, where material can reach any audience it wants, and suggests that when these emerging digital venues cause a shift in the film distribution model, Asian Americans will find them selves poised for popularization. Wong described the next milestone as the changing of generations, where third, fourth, and fifth generation Asian Americans (such as his own son and hypothetical grandson), less and less encumbered by a legacy of expectations and cultural responsibility, will experience heretofore unseen growth in terms of what those individual want to do with their lives (meaning something other than doctors, lawyers, or engineers) simply by virtue of fewer barriers. Wong posited a fantasy where the artist and the audience come together to truly popularize something creative from the Asian American community, that then soars and sets off a chain reaction of open doors and makes the Asian American face a common and equal one. A face that doesn’t need to be Asian, but can just be. Lui went a little abstract when he wondered what personal “questions of self” the panelists ask them selves concerning cultural / ethnic identity, and where on the spectrum of concerns are those aspects in terms of their individual art. Sarover talks about his decision to cast a Malaysian-American as an Indian-American in his film, thinking deeply about the potential criticism from his Indian American community, and guilt over the exclusion of the many talented Indian-American actors that would be suited for the role. Ultimately he applied the standard of “the best actor for the job”, and that his decision here, as is always the case for him, “fundamentally came down to the art”. When Lui posits that there may be something for the Asian American Community to learn from other minority groups that have enjoyed significant integration into the mainstreams of professional/creative society, Navarro suggests that a strengthened self-identification, and a proliferation of creative alliances, which are both qualities shared by the African Americans and Latino communities, might benefit her own demographic’s presence and success from microcosm to macro. B. D. Wong says that Asian American’s may be lacking a “dependable audience,” which is difficult to assemble simply because Asian-ness, which sounds simple, comprises hundreds of different languages, numerous religions, and dozens of countries. He aptly describes America as a “country of outsiders.” He talks about the connection to the American audience, as being about the processing ideas about assimilation, or resistance to it, and tapping into the multitude of ways that that subject can be broached. Wong calls it the Asian American Community’s touchstone to reach a greater audience. More material than can be covered here or summarized was discussed, and I feel all the richer having heard such articulate and thoughtful responses. 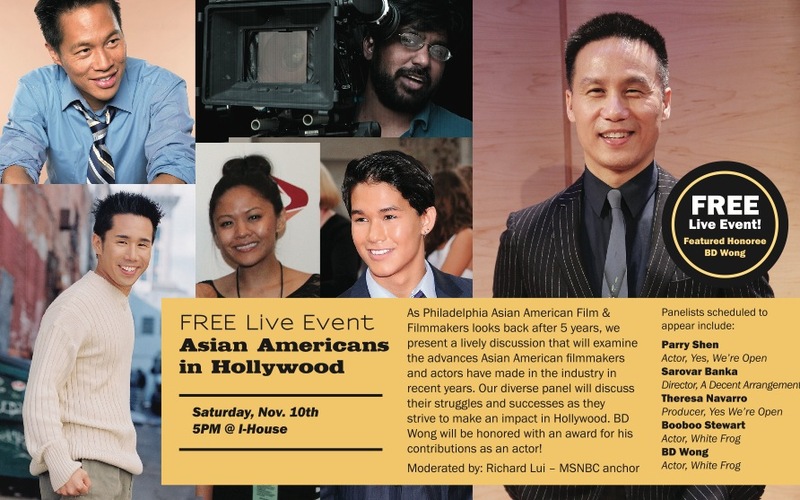 The panel concluded with B. D. Wong accepting an award for excellence in acting, and the festival itself earning a citation for its unique and dedicated efforts to bridge cultural gaps, present exciting new art, and attract eyes to Philadelphia. I AM A GHOST – I don’t use the word masterpiece lightly, but the more I think about I Am A Ghost, the more it seems to earn it. 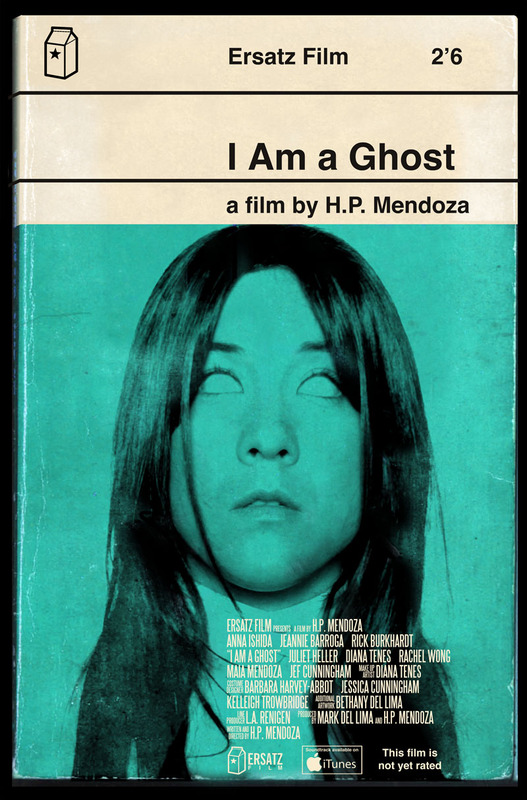 H. P Mendoza’s second feature is easily the best film of the fest’s first half, and is just as easily the best horror film I’ve seen in years. Mendoza has crafted a unique exercise in psychological / supernatural horror, that turns convention on its head and demands patience. Emily (Anna Ishida) goes through the mundane patterns of her day; waking, making breakfast, cleaning a table, Going through a drawer, stabbing herself in the hand…. What we, and Emily finds out is that she is a ghost, haunting the house in which she was murdered. It was smart to place this revelation toward the beginning of the film, not as the climax, because it allows its abstractness and existential potential to flourish. From that point of revelation forward Sylvia, the medium that we never see but whose voice ironically seems to haunt the house, attempts, with difficulty, to coach Emily into the “next place.” Their dialogues take on a Therapist / Patient dynamic, and intensify in their questioning as a darker presence makes itself known in the household. For the better half of the film, I Am A Ghost has more the feel of Bergman than the Boogeyman, where in his Cries And Whispers (1972) the horror is emotional, tied to color, spaces, and memory, with time and space as a flexible medium. Like Cries and Whispers, Ghost is a true mood piece, with a vision so specific, it is unsurprising to learn that Mendoza wrote , directed, shot, edited, and scored the film. For that reason, and the meticulous production design, it feels utterly distilled. Though clocking in at only 75 minutes, I Am A Ghost uses repetition to extend temporality, while it creates an effective structure of confinement. This film will be hard to beat, and impossible to forget. …….Things get really freaky. The Philadelphia Asian American Film Festival returns on Friday with a Closing Night screening of Pearls of the Far East at the International House and will move to the Asian Arts Initiative the following day with three afternoon events, details here.